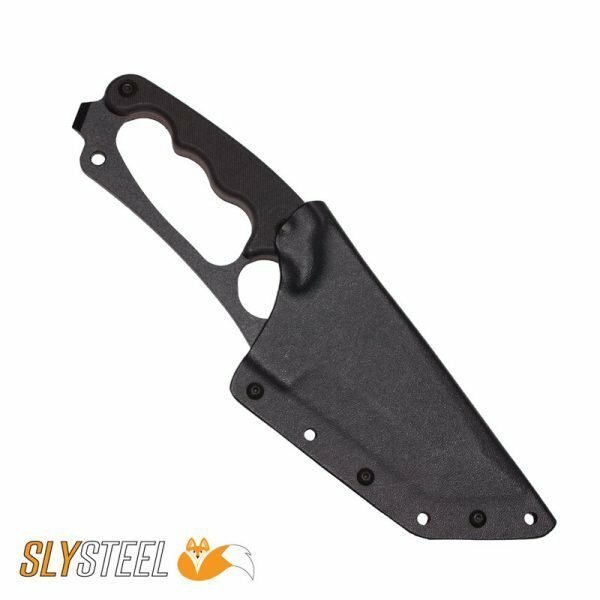 Designed by Oliver Hannan, the patented Shark Tooth Tactical knife features the Split Finger Guard, providing needed protection and retention for military, law enforcement, and firefighters. 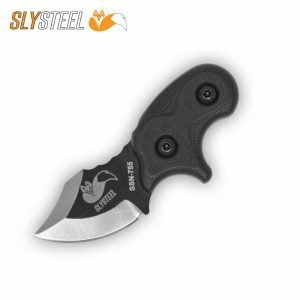 The Patented SLYSTEEL Shark Tooth Tactical knife designed by Oliver Hannan is intended to be an emergency rescue and self-defense tool. It features the Split Finger Guard that provides both protection and retention. The Shark Tooth Tactical features an American tanto blade and is specially designed for strength and deep penetration. 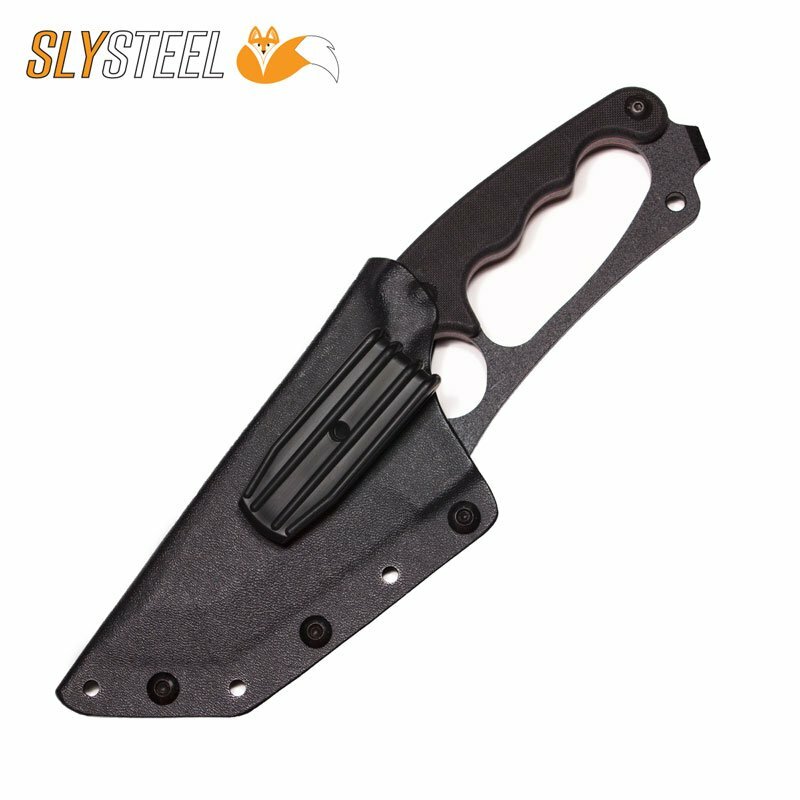 The primary point of the Shark Tooth Tactical has exceptional strength and can easily pierce automobile steel and high tech fabrics such as light body armor. The Tactical is an ideal choice for firefighters, military personnel and law enforcement. 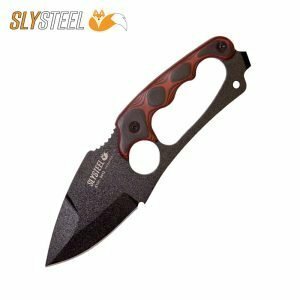 The unique look of the Shark Tooth Tactical knife is created by integrating a hand guard with a traditional finger guard and choil. The result is the SLYSTEEL Split Finger Guard that provides both protection and retention. This unique design feature prevents slipping, provides the user protection from strikes, and allows virtual full use of the hand without putting the knife down. The design provides unparalleled protection in a reverse grip allowing the user to strike, pierce, and defend with confidence. 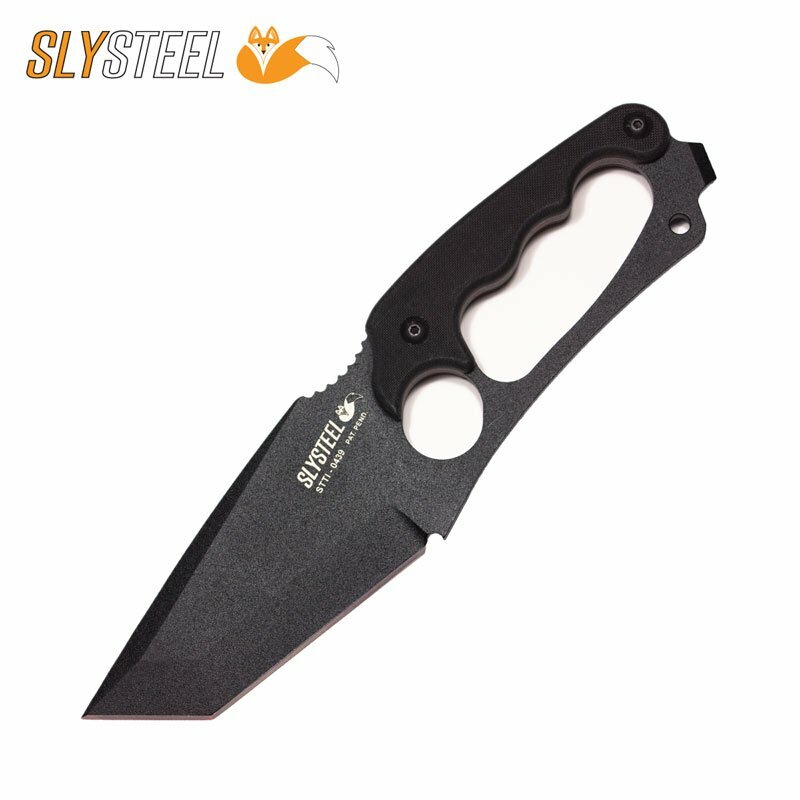 The Patented SLYSTEEL Shark Tooth Tactical knife is currently used by US Navy SEALS and Special Operations, law enforcement officers, and firefighters. The Shark Tooth Tactical is more than just a knife in the hands of these professionals. It is a tool designed, tested and trusted to perform without failure. Firefighters use the Tactical to cut through automobile hoods in order to disconnect the battery and prevent spilled gasoline from igniting. They use it to prepare door jams for their jaws of life, enabling them to extract vehicle crash victims. US Marines use the Tactical to dig entrenchment holes for their machine gun bipods. Others use the Shark Tooth Tactical as a primary emergency preparedness tool in their go bags. 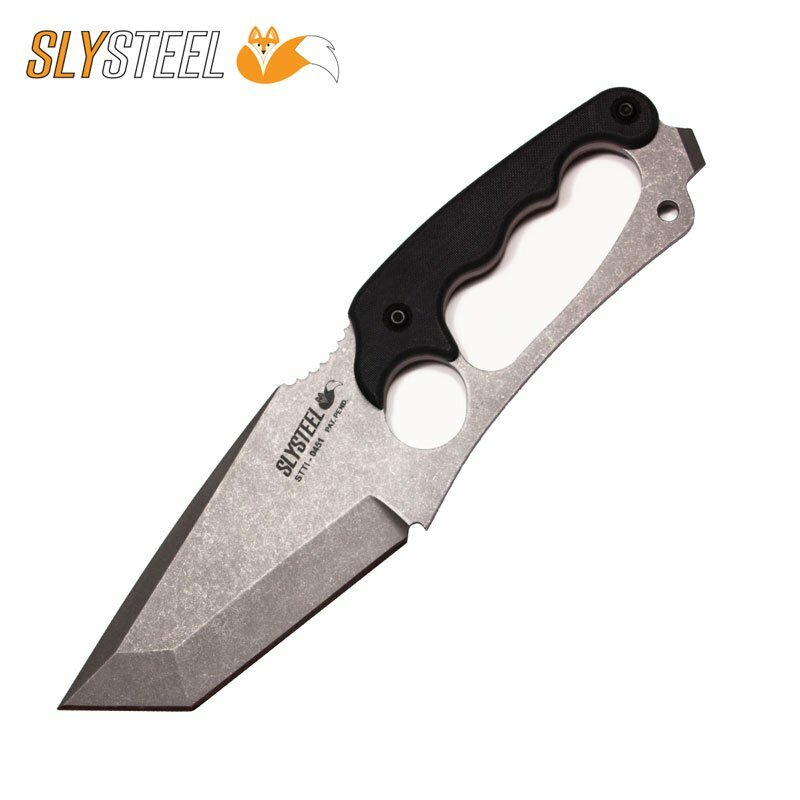 High carbon 1095 steel is well known for its edge retention, toughness, and ease of sharpening. These three factors are what make 1095 a great steel for the Shark Tooth Tactical. 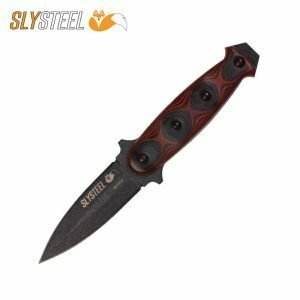 The knife is also differentially heat treated to provide exceptional edge retention while maintaining blade flexibility. The Shark Tooth Tactical has a protective coating, allowing it to be properly cared for with little maintenance. Keeping any exposed steel dry and oiled will ensure a lifetime of use. The Shark Tooth Tactical is epoxy powder coated in black or tan over a tumble finish to eliminate reflective surfaces and to inhibit corrosion. The black and tan powder coats are low reflective for law enforcement and military applications. The tan powder coat is low contrast for desert environments. While the black powder coat is suited for night operations or when discreet tools are required. High visibility colors are available in red, orange, and yellow for fire department and emergency rescue applications. The knife is also available with a clear Cerakote tumble finish for those who like a traditional knife look. The pommel of the Shark Tooth Tactical has a blunt tip that can be used as a chisel or pry tool and is an effective glass breaker. The included lanyard hole allows a user to relinquish their grip without losing the knife. This knife is an exceptional piece of kit. There is no amount of abuse that I have put it through that has yet to even phase it. It’s not subtle or polite, and even in military circles its presence will raise an eyebrow. The Shark Tooth doesn’t transition grips quickly, but the payoff is that once you have it in hand it is secure and will allow enough dexterity to comfortably fire a pistol with it in your support hand. 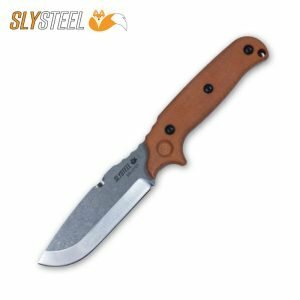 This knife effectively brings the best aspect of a combat knife and a survival tool together with some unique features that make it a real force to be reckoned with. Tactical is implied into the Shark Tooths name for a good reason.When I first held this tool in my hand I envisioned close quarter combat in enclosed tight spaces. My thumb fits perfectly on the jimping with both hand grips and I always have positive control of the tool no matter the circumstances. The choil and jimping make for a perfect alignment for zip tying to a pole. I have utilized the SharkTooth as a digging implement in the desert, sliced through numerous plants/cactus with accurate precision, and used the prybar end as a nut cracker and tool for working bones/flint material rocks in the desert.The wide blade profile makes up for the inherent strength usually found in thicker wedge type knives.I absolutely adore this tool and carry it with me on a daily basis in my vehicle and wanderings. 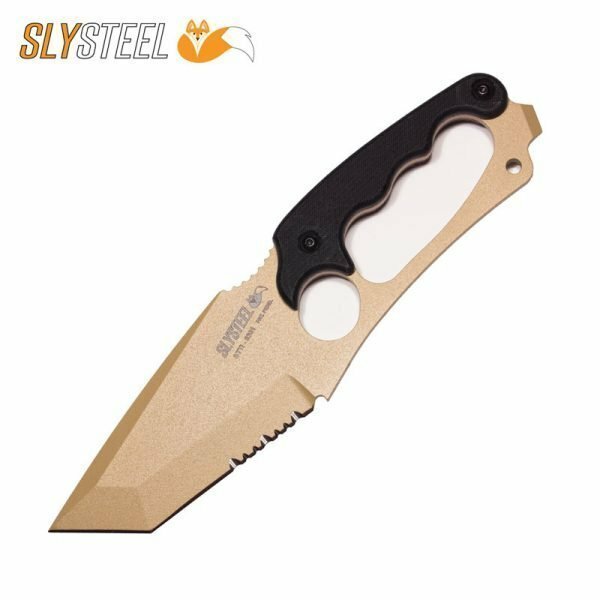 If you are looking for a solid knife, this is it. Well built, comfortable in the hand and innovative design. Perfect for combat or some field use, the shrowded finger guard is great in any situation that has the potential of banging your knuckles. The Shark Tooth Tactical is built to handle anything you can dish out and more.